Rooted in the Gospel and Catholic social tradition, the St. Jerome Social Concerns Committee strives to create educational and service opportunities in concert with community agencies, calling us all to action for a more just and humane world. The Mission of the Committee is to provide our St. Jerome community with opportunities to fulfill their Christian responsibility of service to those in need, as Jesus Christ asked of us. New members are always welcome. Our meetings are usually on the fourth Monday of the month, September through June, in the Kevin Eidt Youth Room in the church hall. Social Concerns Committee minutes are posted at the very bottom of this page. CONTACT: Kathy Coyne, (203) 856-4273. The need is so great that the program has grown each year and great effort is needed to keep it funded. Every year, usually in September, Julie comes to speak at all the Masses after Communion. In the past several years we have been able to raise about $10,000 to help her children. At Christmas time we also ask for gifts for her children to be placed under the “Giving Tree”. We have made Julie’s work the work of the parish. Julie’s ardent message of hope comes out brilliantly in a December letter she wrote to the parish to thank them for their support and can be read here. Julie’s work can be seen in several videos available on YouTube at Education and Hope – YouTube. You will enjoy seeing several excellent videos about the Guatemalan children Julie helps, especially the video about Erik. Occasionally Education and Hope is able to make a much more substantial impact. One video, Casa Diega, is the story of a home built by Education and Hope for a grandmother and the eight children in her care. Donors made it possible to provide her family with a decent home so they might live with dignity. 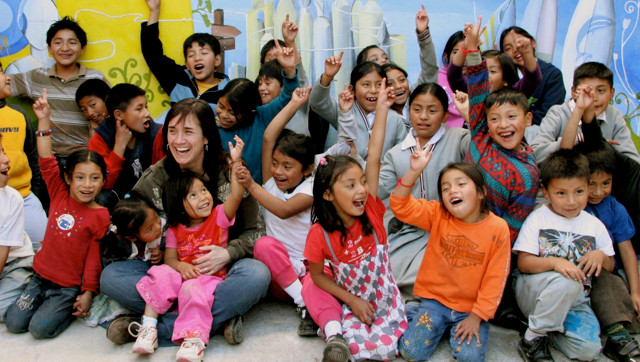 In September 2011 Julie was inducted into the Norwalk High School Wall of Honor for her tireless work to provide hundreds of poor children in Quetzaltenango a quality life through her Education and Hope program.